This is to wish everyone reading and commenting on my blog a very Happy New Year. I hope you’ve all had a great Christmas holiday, and commiserations for those of you, who didn’t. Like Jo, who went the week without heating or hot water. May things pick up for you and I hope you enjoy a better year this year. Oh yes, and down with the Tories! This is just to let you know that blogging might be a bit slow at this end as well, as I’ve also come down with a nasty cold, just as Mike has over in mid-Wales. I did not, however, catch it from him. It’s just something that’s going about, and so I’ve been mostly resting today and dosing myself up with cough mixture. Hopefully, it’ll clear in the next few days, touch wood. I hope everyone reading my blog is fit and healthy, however, and ready to face whatever horrors the New Year will bring! After the Russian Revolution, the Soviet Union became an officially atheist state. Christmas as a state holiday was banned, and religion was very strongly repressed and persecuted. The trappings of the holiday was, however, kept but transferred instead to New Year, so you had a ‘New Year’s Tree’ and so forth. This is another fascinating pic from 70sscifiart. 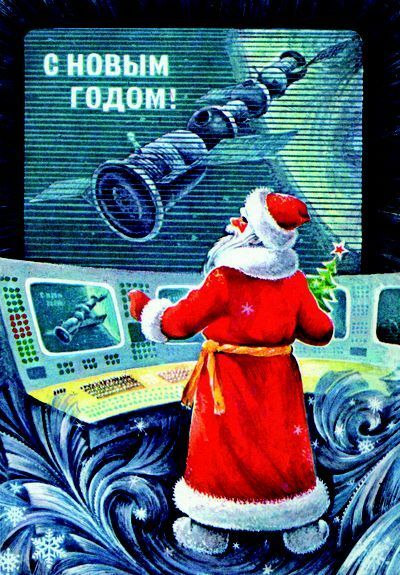 It shows a Soviet ‘New Year’ Santa looking out at one of the Salyut space stations, which the Russians were then using to smash the records for the longest stays in orbit by humans. It shows both the seasonal greetings and the pride the Russians had, and still have, in the achievements of their space programme. 70sscifiart is on Tumblr at http://70sscifiart.tumblr.com/. Go there for more vintage space art. This is just to wish all the readers of this blog a very Happy New Year. I hope you all had a good Christmas, and that you will enjoy a peaceful and prosperous New Year. Despite the efforts of the Tories to destroy any decency and joy in our civilisation, of course! This is just to wish all my readers a very happy Christmas, and a peaceful, prosperous and happy New Year. And don’t let the government and DWP grind you down. This is just to wish all the readers and commenters on my blog a very Merry Christmas, and I hope you have a happy, prosperous and healthy New Year. Very best wishes to you all, and hope you have a peaceful snooze through all the Christmas repeats.